Home > Making Progress > Will I Ever be Ready for the Marathon? The marathon is as much a state of mind as it is a test of physical endurance. The body may indeed be willing even after 18 miles, but all too often the psychological pressures can be enough to make many competitors fall by the wayside.So while it is essential to put together an effective training programme that will prepare you for the rigours of the race, there has to be time spent thinking about both why you want to take up the challenge and how you foresee yourself mentally meeting it. You don't have to be superhuman to run the marathons. The popularity of the distance that has been the result of high-profile events such as the London Marathon has proved that. While hesitating to describe anyone as “ordinary”, it is the ordinary, everyday, man and woman in the street rather than the highly tuned professional and amateur athletes that have been the real stars of the show over those 26 miles. So, yes, anyone passed physically fit enough to begin training by their doctor can attempt the marathon. But given the dedication needed in preparation, being “ready” to accept the challenge revolves around your motivation. Perhaps it is the challenge itself that will drive you on, a chance to prove to yourself that you are capable of meeting it. Or your efforts may be spurred on by the thought that succeeding will have a financial bonus for a charitable cause. Alternatively, it may be that you want to bring some focus to your training - once you have realised a certain level of fitness, you may be looking for a new goal to fuel your enthusiasm for running. Runners gearing up for their first marathon should have one very clear goal in mind: to finish. It is all very well talking about aiming to come home in under four hours, but this is only heaping more psychological pressure on before the true test has even begun. D-list celebrities may rattle on about the “journey” they've experienced to satisfy the demands of reality TV, but the marathon really is one, containing more highs and lows both physical and psychological than you could ever imagine until you have gone though it and come out the other side. It is essential to relax, tell yourself to go out and enjoy the experience, and then see what the day brings. If you don't finish, dust yourself down and tell yourself that you tried. But if you do cross that line, never underestimate the scale of the achievement. After that, it's down to the individual. Some may tick it off on their list of things to do before they die; others may decide they want more. It is when you have completed the race that you can start thinking about the next marathon challenge: setting a target time. 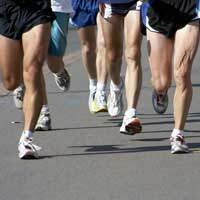 Many people who train for and complete the marathon have never run a race before in their lives. Others are likely to be veterans of the 10k or the half marathon. Some who have succeeded at lesser distances find 26 miles is just too much. In short, it is impossible to use previous race experience as an indication that you will complete the ultimate test. So once you have your motivation, and your goal is clear, then it's a case of preparing to the best of your ability and performing to the maximum on the day. No-one can ask any more of themselves.